"Up The Creek Xpeditions is a five-diamond outdoor entertainment source! Cabin Bluff Lodge has discovered that they are the best in outdoor kayaking adventures. Their trips are catered to the individual groups to ensure that they are educated, entertained and have fun along the way. Jennifer and Pete have put together a great operation with the best in equipment, a very qualified staff and they ensure that safety is foremost. They listen when you have special requests and needs, ensuring that those requirements are surpassed! If coastal Georgia is in your future plans, their trips are a great way to see it." My husband and I went kayaking with them last week and had a great time. We live up in St Marys. We did Lofton Creek (Yulee, FL- only about 20 minutes away) which is a very easy and relaxing paddle. Jen and Pete are just all around great people! We had a good time just getting to know them as well. 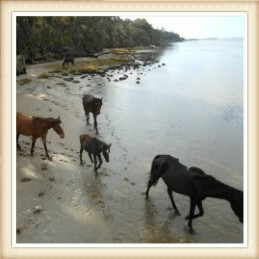 Hope to return soon to do the Cumberland Island trip! “Great kayaking adventure” We had a great time on our private kayak ride around the harbor in St. Mary's. We were met (without having to put down a deposit) site unscene by the owner's as the docks with our kayak. They told us to stay out as long as wanted, gave us detailed maps, great directions, and a very warm personality. My girlfriend had never been kayaking before so she was a bit nervous, but had a great time in a very safe kayak. We were able to see otters, plenty of birds, and a beautiful sunset. When we were finished we just left our kayak on the shore and sent the owners a text. What a great time! “Best Paddling Adventure Group EVER!” My boyfriend and I recently went on a trip to Cumberland Island, and decided to kayak to and from the island instead of taking the ferry. As neither of us had ever paddled in that area before, we were a bit hesitant at first, but after speaking with Jen we were sold. We rented two single kayaks for 5 days, and the service that was provided with them was absolutely amazing! Jen and Pete were there to answer any question along the way, gave amazing advice on tide times, and went out of their way to make sure our trip was perfect. When Pete dropped us off at our launch point, he even took pictures of us paddling away, which he later sent to us! It was such an amazing keepsake of the trip, and pictures we are sure to have forever. We would HIGHLY recommend them to anyone, and hope to get back down to Georgia soon so we can go on another expedition with Up the Creek! They are sincerely the absolute best. Kayaking and Canoeing are by far the most beautiful ways to enjoy our coast. If you’re looking for a little bit of adventure and a whole lot of fun, or just an opportunity to escape the grind and enjoy a little sunshine, fresh air and wide-open spaces, we have your cure. 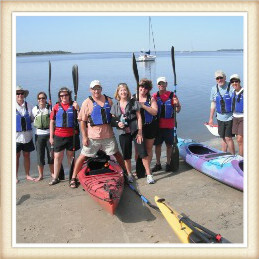 Adventures Up The Creek specializes in professionally Guided Kayak Tours and Giant War Canoe tours on some of the most iconic and picturesque waterways in St Marys, Georgia, Jacksonville and Amelia Island Florida and throughout Northeast Florida and Southeast Georgia. Peaceful black-water creeks, beautiful salt marshes and adventurous island hopping can all be found within minutes of Amelia Island and Jacksonville — and so can destinations like the Jacksonville Zoo & Gardens, Kingsley Plantation and Big Talbot Island. St. Marys, Georgia, offers wonderful kayaking opportunities like Cumberland Island National Seashore and Crooked River State Park. We can provide fun-filled and family-friendly adventures for your group year-round. Book one of our no-hassle adventures today. We will make the arrangements, provide the knowledge, expertise and equipment, and supply snacks and other essentials so you are free to create memories, build bonds and experience the adventure of a lifetime. For those who love the outdoors, kayaking the rivers and marshes of Coastal Georgia and Florida is a little slice of heaven on Earth. We strive to have each customer leave with a lasting memory of an amazing experience. 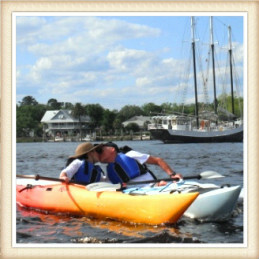 We have had the honor of introducing people of all ages and abilities to the natural wonders of kayaking. All that’s required on your part is an adventurous spirit and openness to experiencing new things. No matter where you want to paddle we’ve got you covered! From wind-swept estuaries and driftwood-covered beaches, to still, blackwater creeks meandering through cypress swamps, the Amelia Island area is home to some of Northeast Florida’s most scenic waters. Wild horses and miles of deserted, sugar-sand beaches are just a couple of the unique treasures which give Cumberland Island its beauty and charm. Kayaking to Cumberland adds an element of adventure to your visit. Historic waterfront buildings, salt marshes and a marina made for sunsets provide an ideal backdrop for leisurely paddles – and the perfect place to start or finish any kayak adventure. Dolphins and River Otters are regular visitors in this scenic, coastal harbor. Experience Urban Kayaking on the St.Johns in the heart of The River City; visit the Jacksonville Zoo by kayak; paddle at the beach; or, explore marshes and protected harbors of the First Coast – all within minutes of Downtown Jacksonville. If it’s your first time paddling with us, you may have some questions about planning your guided kayaking tour that will hopefully be answered on this FAQ page. They say, “A picture is worth a thousand words.” Check out a sampling of our trip photos here and see what they say to you. 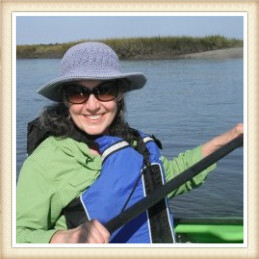 If you have your own kayak and are planning a kayaking trip to the Cumberland Island-St.Marys, Georgia or Amelia Island, Florida area check here for free resources. We offer guided kayaking tours for individuals and groups as large as 40-guests. Group kayaking adventures are perfect for weddings, reunions, business meetings, team-building, wellness programs, church groups, school groups or for just getting away from it all with a few friends and letting-go. If you’re traveling and don’t want to carry your kayak, or if you’ve paddled before, but don’t own your own boat, then we have boats and equipment available for you – and we can provide you with local trip planning details. If you’re not familiar with coastal kayaking, we suggest joining us on one of our many guided tours. 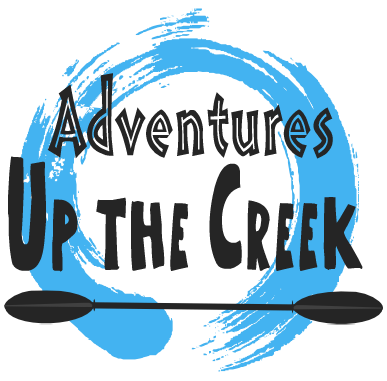 Up The Creek can teach you what you need to know in order to become a safe and competent kayaker at any level you desire. We offer customized programs designed to quickly help you reach any skill-level you desire or simply make you feel confident kayaking on the coast. Tired of the same old company outing? Let Up The Creek treat your employees to a truly memorable day together. We have developed team building, corporate kayaking activities, staff rewards and client entertainment for some of the country’s largest companies. Adventures Up The Creek has been a family-owned and operated kayak tour company for more than 20-years; which means nobody knows more about showing your family or group a great time on the water – and nobody knows more about the local waterways than our staff of professional guides and instructors. Our experience allows us to take your group to the out-of-the-way places very few people ever see and create positive and lasting memories of exciting adventures. We feel blessed to be sharing our passion for the outdoors and paddling with our guests. Our family would love to take you and yours paddling and show you not only why we love to paddle, but what sets an experience with us apart from the rest. The best way to enjoy the abundant wildlife and beautiful scenery surrounding Amelia Island is with a guided kayak tour, and it would be or pleasure to share that with you. Life’s Short and Paddling’s Cool, so let’s go kayaking. 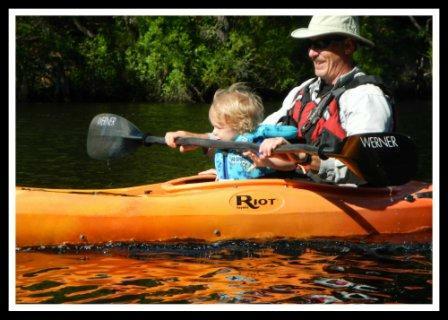 Papa Pete welcomes our fourth generation to our family paddling company. Our son, Jacob, has been paddling since he was 6-years-old and, following in his dad’s footsteps, our sweet grandson Madyx has had his first big kayak adventure (at 2-years-old) and he’s hooked. He also loves Stand-up Paddle Boarding and looks great in the Big Canoes! It’s not just a job for us, it’s a lifestyle. We take time and actually teach you how to kayak. We Respect the local culture, fauna and flora. We believe that your fun is our success. Adventure feeds the Soul. Rejuvenate and replenish your soul with a Kayaking Adventure on Florida’s First Coast — or by Kayaking Georgia’s Golden Isles.